Celebrate the winter season with a winning combination of piercing scent floating on clear, cold air. Celebrate the winter season with a winning combination of piercing scent floating on clear, cold air. 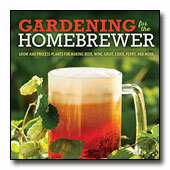 Plant a collection of fragrant plants that bloom only in the darker months. If you place these plants where you walk by them on the way in and out of your house, they give cheer on your daily rounds. The appropriately named wintersweet (Chimonanthes praecox) sends its scent on the breeze for many feet. The waxy yellow flowers start opening in early January and continue through February. 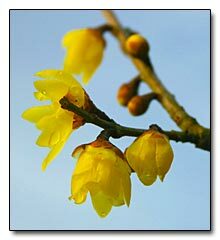 Chimonanthus reaches 12feet in height, requires little summer water, and likes a sunny spot. A background plant when out of bloom, mine is in a spot by the entrance to the back alley, where I hardly notice it except when the stunning fragrance perks up a cold winter day. 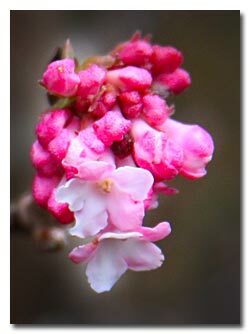 Viburnum x bodnantense has a long bloom period, often starting in November and continuing through the winter. The light pink bells are clustered on bare branches. Plants can reach the height of small trees, 12 to 14 feet, or kept lower by pruning. A gardening friend once mistook the one in my garden for a winter-blooming cherry, giving an idea how pink and floriferous the plant is. This plant does well in a range of exposures, from shade on the north side of the house to full sun. Most daphnes bear fragrant flowers, and two of them bloom in the winter. Winter daphne (Daphne odora) scents the air in February and March with small flowers on an evergreen and often variegated shrub sprawling to 4 feet. This is one of the sweetest scents of late winter. Daphne has a reputation as being fussy and needing sharp drainage to thrive. Although this daphne tolerates shade, I have also seen it do well in a hot, western exposure. February daphne or mezereon (Daphne mezereum) blooms on bare wood with clusters of old-rose colored blossoms that turn into red berries. A white-blooming form has yellow berries. The fragrance is far-reaching and glorious: tuck one into a border and your friends will ask where the scent is coming from. Another member of the Daphne family, Edgeworthia, is a fairly new introduction to the Northwest. Edgeworthia chrysantha (sometimes offered as Edgeworthia.papyrifera) has narrow, deciduous leaves. In mid winter, fragrant yellow flowers open from silver buds. 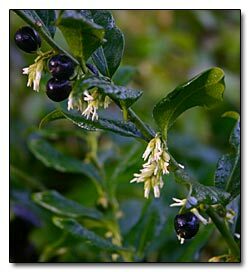 Sweetbox (Sarcococca) is an evergreen for shade, with small white flowers hiding along the stems under the glossy leaves. Sarcococca hookeriana var. humilis is the lowest growing, at 18 inches. Sarcococca ruscifolia with red berries and Sarcococca confusa with black berries both grow to four to six feet. The small, white flowers hide in the evergreen foliage. The entrance to the Graham Visitor's Center at the Washington Park Arboretum in Seattle creates a shady pocket for a planting of Sarcococca, which provides a fragrant greeting as you enter the building. A shrubby honeysuckle? Lonicera fragrantissima is not a vine but a shrub with fragrant small, white blooms in late winter. Mostly evergreen in our climate, it can reach 8 feet. Use it as a freestanding hedge, trim it into a hedge, or let it sprawl up a wall. No winter-fragrant collection should be without Chinese witch hazel (Hamamelis mollis) whose golden yellow flowers with crumpled petals have a spicy fragrance and bloom a month or more, starting in January. The plant can be grown as a shrub or small tree, and can reach to 20 feet or more in time. Look for the large selection of hybrids that sport flower color from coppery red to pale yellow. To create a spectacular show, place witch hazel so the low winter sun backlights the flowers. These and other plants with winter fragrance give us good reasons to visit a nursery to see what is in bloom. Or stop by a public garden. The Washington Park Arboretum in Seattle has a winter garden featuring most of the plants discussed above.